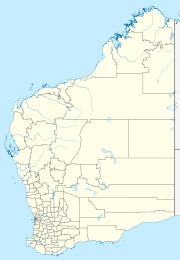 Burringurrah (also referred to as Mt Augustus) is a medium-sized Aboriginal community, located in the Gascoyne Region of Western Australia, within the Shire of Upper Gascoyne. In the 2011 census, Burringurrah had a total population of 117, including 102 Aboriginal and Torres Strait Islander people. The community is situated on a 45,000-hectare (110,000-acre) reserve that was excised from the Mount James pastoral lease. It was incorporated in 1999. The community store had to close in 2011 saying that the transient population made the business non-viable. The remote CMS had taken over the store in 2009 and had kept it running until 2011 despite closing for a short while from seasonal flooding. The 2011 floods had isolated the community for a few weeks and it was not until nearly a year later, in early 2012, that all basic services were returned to the town. The community is located within the Registered area of the Wajarri Yamatji (WAD6033/98) Native Title claim. The community is managed through its incorporated body, Burringurrah Community (Aboriginal Corporation), incorporated under the Aboriginal Councils and Associations Act 1976 on 9 September 1987. Burringurrah Layout Plan No.2 has been prepared in accordance with State Planning Policy 3.2 Aboriginal Settlements. Layout Plan No.2 was endorsed by the community on 16 February 1999 and the Western Australian Planning Commission WAPC on 21 October 2003. The Layout Plan map-set and background report can be viewed at Planning Western Australia official site. ^ "Community profile - Burringurrah". Gascoyne Development Commission. 2012. Archived from the original on 19 May 2009. Retrieved 26 March 2013. ^ "Burringurrah store to close doors". Australian Broadcasting Corporation. 9 March 2011. Retrieved 26 March 2013. ^ "Services return to Burringurrah". Australian Broadcasting Corporation. 23 January 2012. Retrieved 26 March 2013. This page was last edited on 27 July 2017, at 19:55 (UTC).